The ultimate combination item of three vital nutrients to support high intensity workouts and optimize physical performance! Doctor’s Best Inc. Science Based Nutrition™ announced today the release of its new CoQ10/L-Carnitine/Magnesium for sports nutrition enthusiasts. Doctor’s Best CoQ10/L Carnitine/Magnesium is made with naturally fermented Coenzyme Q10 and Chelated Magnesium that is much easier on your digestive tract and more absorbable. Our formulation is Vegan, Non-GMO, Gluten Free, Soy Free, and is a unique blend of nutrients that supports energy, muscle mass, and muscle recovery. This convenient combination is designed to help support your high intensity workouts and optimize your physical performance. “This unique combination of high-quality ingredients will provide sports nutrition enthusiasts with three vital nutrients in one convenient form that will support and optimize their performance,” said Bill Damiano, VP of Sales. 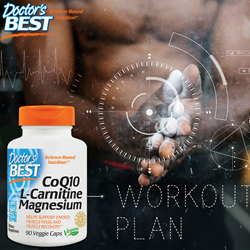 Doctor’s Best CoQ10/L-Carnitine/Magnesium ingredients have been clinically studied to ensure efficacy and potency. Doctor’s Best CoQ10/L-Carnitine/Magnesium is now available for sale to the public.